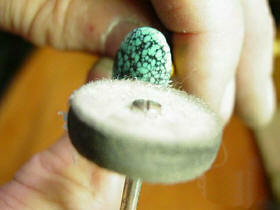 This is an overview of the items you need to slab, shape and polish turquoise. The mandrel has a screw that fits a 1/16″ hole and can have either a 3/32″ or 1/8″ shank. 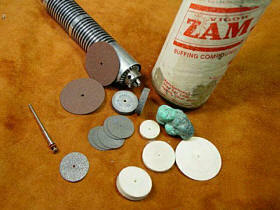 Zam is the best compound to use on felt buffing wheels when polishing turquoise. 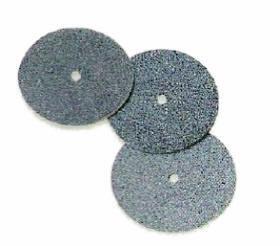 These are aluminum oxide cut-off discs. 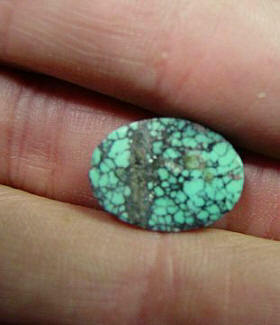 They range in size from 7/8″ to 1 1/2″ they can be used to cut off slabs of turquoise or similar material in prepgalion for making cabs. They are very fragile and break easily when they are used to cut stone. Always wear eye protection when using these thin cut-off discs. These are silicone carbide cut-off discs. They range in size from 7/8″ to 1″. They seem to be coarser than the aluminum oxide cut-off discs. This is a Panavise. It may be used to hold the Foredom handpiece while the stone is worked against the various grinding wheels mounted in the handpiece. The cut off discs are mounted in a mandrel which is mounted in the Foredom handpiece. The cut-off disc is rocked back against the stone when cutting a slab mom the raw stone.The disc must be moved in the raw cut so that it is always parallel to the cut. If the disc is twisted to the saw cut the disc will fracture. Do not use heavy pressure. Be patient. Always wear eye protection when using the cut-off discs. The Foredom handpiece can be mounted in a panavise. This frees one hand to assist in holding the stone. 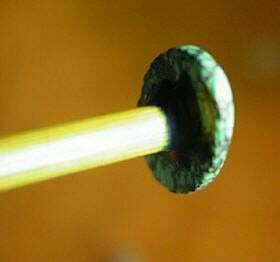 This photo shows how deep the cut-off disc can penetrate a stone.The depth of the slot the disc can cut in the stone is limited by the distance between the outer edge of the mandrel screw and the outside edge of the cut-off disc. 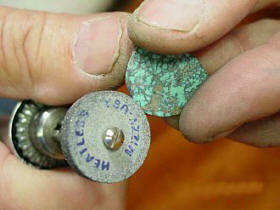 The cut-off disc can be rotated around the stone. Therefore the largest slab that can be cut is about twice the distance between the outer edge of the screw and the outside edge of the disc or around 1.3″. 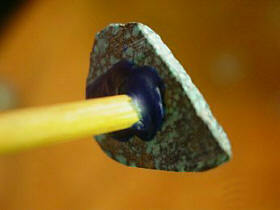 The slab can be held in the hand while working on it or it can be bonded to a stick with doping wax. 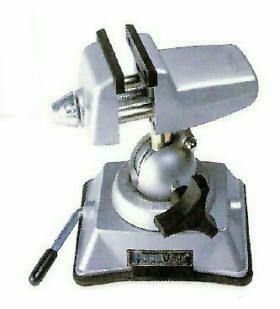 The slab can be shaped using a mizzy wheel mounted in the Foredom handpiece. The edge of the cab to be should be cut at a slight angle. The angle is normally about 14°. This is what a stone might look like once the edge is ground. The surface of the stone is flat. The surface of the cab will be convex. The height of the cab will be determined by the thickness of the slab and the desire of the carver.The top surface is shaped once the edge is cut. The stone can be held in the hand or on a doping stick. The Foredom can be hand held or mounted in a panavise. 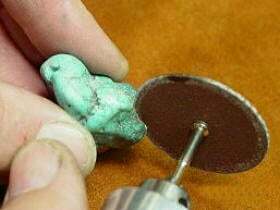 When hand held the cut-off disc in the handpiece is rocked back and forth with wrist action across the stone until the cab is formed. The Foredom handpiece can be mounted in a panavise. 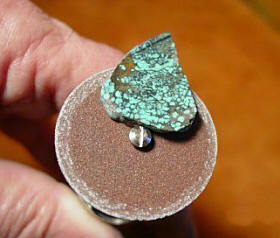 The stone is then rocked back and forth against the cut-off disc. Continuous rocking action is requires so no flat spots are formed on the stone. 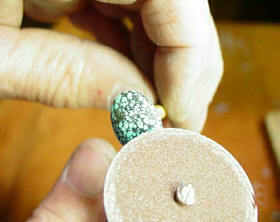 Once the stone is shaped it should be sanded with well worn 600 grit wet sandpaper. The sandpaper is held in the hand and is moved over the stone.The stone is polished with zam on a felt wheel once the stone is sanded. 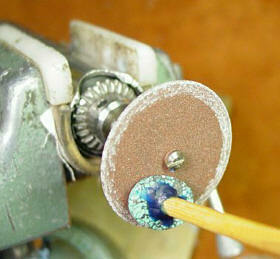 The spinning felt polishing wheel is charged when it is placed on the zam. Continually rock the polishing wheel over the stone. This should produce a fine finish on the stone. 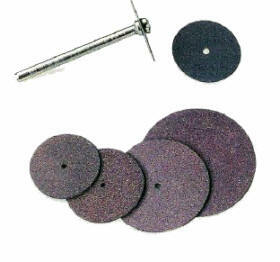 A better method of shaping and polishing the stone can be done with these diamond charged wheels. They are a more expensive. All rights reserved internationally. Copyright © Lee Epperson. Users have permission to download the information and share it as long as no money is made. No commercial use of this information is allowed without permission in writing from Lee Epperson.